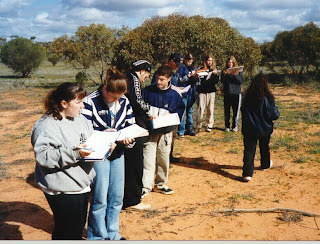 Images above: Students at Findon High School in Adelaide collecting data in the field - from within the school grounds to the outback - all fieldwork! "Schools should place a renewed focus on traditional geography field trips to stop pupils being trapped behind computer screens in the classroom", Michael Palin has warned. Fieldwork makes geography come to life, puts everything into context. Field work is the process of observing and collecting data about people, cultures, and natural environments. Field work is conducted in “the wild” of our everyday surroundings rather than in the semi-controlled environments of a lab or classroom. One of the hotspots during discussions as the Australian Curriculum: Geography has been developed and written has been the place of fieldwork in geography. Most geographers see fieldwork as fundamental to good geographical education and consider that it is fieldwork which makes our subject unique in the school curriculum. Whilst the discussion is not on the worth of fieldwork, the issues are about to what extent we can mandate it and make it an expectation of all who teach geography from F-12. Issues of inclusivity for all, cost, risk, ability of non-geography teachers to conduct fieldwork and the time involved (often in other class time) come into the equation as jurisdictions and schools consider the mandating of fieldwork for all year levels. If we are going to see fieldwork embedded in the aims and pedagogical expectations and in turn mandated, we need to review the nature of fieldwork, reasons why it is so important and provide a few examples for consideration. This posting and the next few are dedicated to these fieldwork considerations. Hopefully they provide useful background for the writers of the Australian Curriculum: Geography to mandate fieldwork in our schools, as all classroom geographers desire. In essence, geographers regard fieldwork as a vital instrument for understanding our world through direct experience, for gathering basic data about this world, and as a fundamental method for enacting geographical education. This YouTube called “Why is fieldwork important to geography” from our friend in the States, Joseph Kerski, President of American Geographers is a good starting point. Fieldwork is an important part studying geography. Fieldwork offers a wonderful way of seeing the world, and a chance for personal development. Doing fieldwork can make a difference to your life and future career. At this stage, before watching the South Australian fieldwork trials which will be showcased in the next few postings, it is useful to look at the fieldwork packages and the associated pedagogies on a wide range of fieldwork from the Barcelona Field Studies Centre in Spain. Great case studies! To support our thinking on the pedagogy of fieldwork, the types and examples from the Field Council site in the UK are also a great resource to review. As an Australian example of fieldwork here is the GeogStandards project documentation of the work of AGTA’s friend Stephen Cranby in Victoria.